BRISTOL - As the Bristol Central gym was clearing out early Saturday evening, all one could see was the color blue all over. 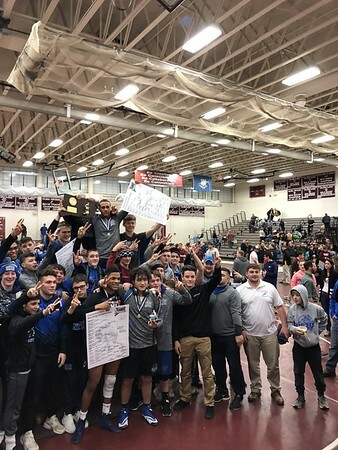 It was because Bristol Eastern wrestling was celebrating back-to-back Class L state championships, the first time doing so in school history. Bristol Eastern took first place of 24 teams competing finishing with 231 points, 34.5 points ahead of second place Xavier. The Lancers sent six wrestlers to the championship bout and had four come out champions. Diego Fernandez (145 pounds), Justin Marshall (152), Barrett (160) and Trinidad Gonzalez (195) all were champions in their respective weight classes. Fernandez, Marshall and Gonzalez all won by decision. Barrett won via a major decision. Bryce Beebe (106) and Jordon Champagne (113) took second place. Also placing for Bristol Eastern was Carson Sassu (126 pounds), Tom Nichols (120) and Hidekal Mangual (220). Sassu was 4th, Nichols was 3rd and Mangual was 5th place. Fernandez’s story is especially interesting, as he has been wrestling for just over a year. From being on the junior varsity team to now being a state champion is an accomplishment that took plenty of work but paid off big as Fernandez shined in his final match. Gonzalez and Barrett both repeated as state champions after having won their weight class last year. For a junior, Gonzalez’s career has been dominant and he still has more left this year with state opens approaching and a chance to go to New Englands. Bristol Central placed 7th in the tournament with 102.5 points and had a state champion at 120 pounds in senior Chris Trelli. Trelli won by a major decision and avenged his loss from the finals last season. The Rams had three other wrestlers place. Mike Guzman (220) finished in third place, John Duncan (285) and Damian Mahaffy (170) both placed fifth. Having its four seniors place was a goal coming into the tournament for Bristol Central. Duncan’s performance stood out, as it wasn’t long ago that placing at the Class L tournament was seen as far-fetched and something that Duncan had to train hard in the gym in order to do. Next up for both programs is the State Open. The Lancers are hoping to make a splash and win the tournament as a team. Danbury is considered the favorite to win the State Open. The Rams hope their four seniors build off of their performance in Class L’s. Posted in The Bristol Press, Bristol Central, Bristol Eastern on Saturday, 17 February 2018 19:14. Updated: Saturday, 17 February 2018 19:17.